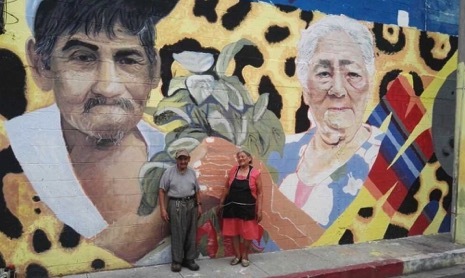 In 2015, the World Food Program partnered with the Municipiality of El Salvador to launch a youth training program that used street art techniques to tackle social insecurity and build social cohesion: Conectarte’. Twelve years of civil war and a pervasive gang culture has resulted in a lack of opportunities for youth who suffer from unemployment, high violence and discrimination. 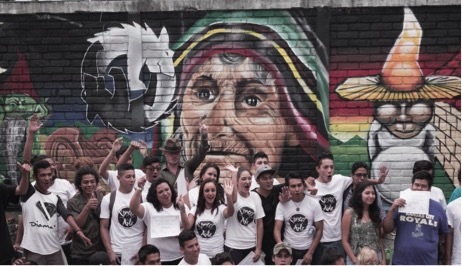 In 2015, ConectArte’s 9 month full-time training program was launched with 50 at-risk youth from the regions poorest communities, who learned basic street art techniques, participated in 80+ hours a month of trainings/practical activities and ultimately received a monthly 75$ food voucher – redeemable in any local supermarkets1. The workshops were multidisciplinary in their approach: ranging from educational sessions on nutrition, cooking classes to developing basic art techniques such as drawing, painting and sculpting. The aim was to create a sustainable framework which not only alleviated poverty and food insecurity, but also tackled re-building communities and a cultural identity2. The project cycle was as follows: international artists teach key skills to local artists, who in return instruct the youth, who integrate their newly acquired knowledge within their communities. The murals created by the youth were reflective of their own personal experiences and stories. 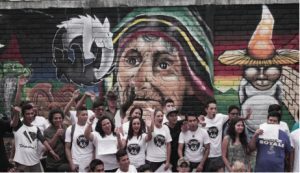 To design the mural each youth was provided with a disposable camera and took photos of their community and daily lives. The group then selected their favorite images in order to collage them into the final mural. These murals contributed towards changing the atmosphere of the urban-slums and livening up dull and muddy streets2. According to a recent interview with ConectArte’s past Programme Officer, Isabella Bianchi, it was not only empowering for the youth, but empowering for the entire community. There is a lack of actual “community” by definition: trust and cooperation are scarce and limit the interactions between locals2. The act of creating a mural was an act that required a combined effort. The project equipped youth with practical and life skills, knowledge and above all – hope for a future that transcends the conventional options of either gang-recruitment or migration. There was a newfound incentive and relationship towards the space. For many families having endured displacement and instability, creating a mutual and collective area reminded them of their right to occupy the land2. The final project included painting a mural, devised by the different youth groups, who sought assistance from family, friends and neighbors. Each group created their own unique work plan, which was supervised by the international and local artists. WFP and the Municipiality allocated painting resources; purchasing materials and hiring assistance2. One community created a community garden, building benches, and painting a mural behind the benches that simulates the bookshelves of a library. The artist collectives advised them to add real books to the space, and volunteered to donate several samples. The operation involved the entire community. In order to realize the project the youth had to ask permission from community board members and the Municipality of San Salvador2. ConectArte contributed not only temporary relief but also created social cohesion by pushing ‘self and collective efficiency within communities’2. The initiative encouraged the development of positive values and assets within neighborhoods. It lead people towards collective action. Ultimately, the programme had the youth reflect upon their cultural identity and improving their living conditions.